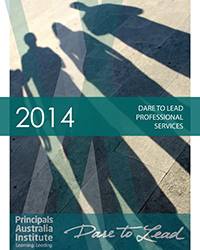 Principals Australia Institute invites you to take part in our 2014 National School Leaders Survey. Over 3000 school leaders have completed the survey so far. With less than a month to go, don’t miss this important chance to have your say and shape the future of school leadership development in Australia. 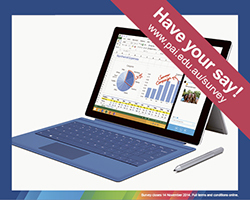 As our way of saying thanks - one respondent will receive a Microsoft Surface Pro 3 tablet. What does it mean to build, develop and sustain the principal profession? How is the promotion and elevation of the profession’s status of benefit? 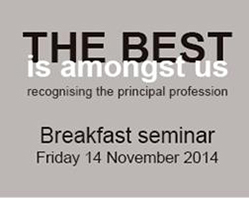 Join seminar discussion leaders, Dr Warren Marks, with Alan Rice AM, Louisa Rennie, as well as a panel of principals and seminar attendees for a vibrant and thought-provoking discussion on Friday November 14 at our breakfast seminar: The Best is Amongst Us: Recognising the Principal Profession. Book your place now, or join the discussion on the day - follow @Principal_Lead and use #PrincipALL. In consultation with principals, Principals Australia Institute is leading the development of the Australian Principal Certification Program, a quality assured and publicly accountable process for recognising the leadership of principals putting the Australian Principal Standard into practice. 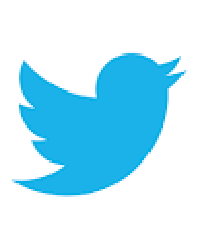 On Wednesday, 29 October, from 7:30 to 8pm (AEDT), the Certification Team will hold a Twitter conversation to explore ‘the principal profession’ - we’d love to hear your views. Follow @Principal_Lead and @pai_edu for updates and further information, and use #PrincipALL to join the conversation. Principals Australia Institute staff are working closely with principals and school teams throughout Australia to assist them in implementing MindMatters. 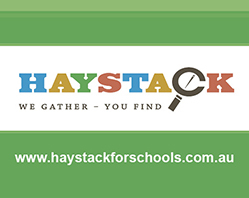 Hundreds of schools are accessing the new look MindMatters that is a unique combination of online learning tools and face to face Leadership Briefings, Getting Started events and implementation support for school staff. The first three learning modules are available online and further modules will be available soon. Principals are reporting that the combination of online and face to face implementation is a wonderful way of upskilling staff in online learning whilst at the same time offering effective classroom and whole school strategies to build a mentally healthy school. Google is inspiring young Australians to think big. The Careers with Code guide profiles successful entrepreneurs and provides examples of how computer science skills can make a significant impact - ranging from saving the lives of premature babies, creating interactive maps, and helping people stay safe during natural disasters. 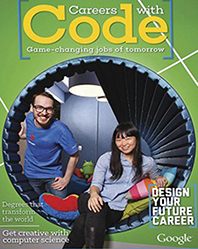 The guide features a broad list of university degrees for students interested in computer science and coding. Dare to Lead - with its focus on supporting school leadership to enhance Indigenous students’ outcomes and reconciliation - is offering a range professional services to all schools in 2015. The 2015 edition of its Professional Services Guide will soon be released. It lists the range of services available to schools and facilitated by experienced school leaders. Email Peter O’Beirne to ensure you receive a copy. KidsMatter Primary provides families and schools with a range of information sheets to help them support children’s mental health and wellbeing, and to recognise if and when professional help is needed. Some of the information sheets were recently translated in other languages and are now available from the website. 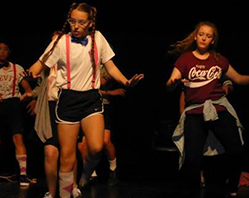 Congratulations to the nine ACT secondary schools who took part in the PAI Dance and Drama Wellbeing Festival. Over 300 people witnessed a showcase of polished, moving and engaging performances about what wellbeing means to students. All the performances sent powerful messages about the importance of resilience and seeking help. The event was supported by the ACT Department of Education and Training, Mental Illness Education ACT and Batyr. Photo: Students from Wanniassa School with their performance which showed that connection between different subgroups at school helps to promote a healthy person and school. Your life just got simpler! Looking for educational products and services? Look no further. PAI has launched a new online catalogue. Over 700 businesses listed so far. Extensive range of categories including educational, professional and personal needs. The Queensland Education Leadership Institute (QELi) has released its Prospectus 2015, which is now available online, via email or phone 07 3007 5222. The Victorian Government’s Bully Stoppers campaign has launched a new series of tools and resources for parents and students to support students in preventing cyberbullying.